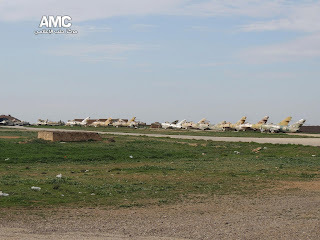 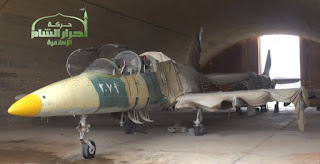 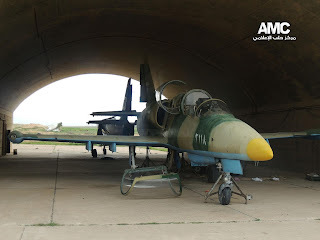 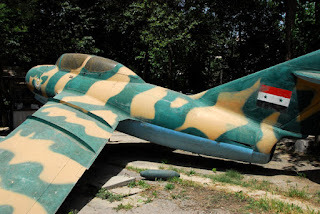 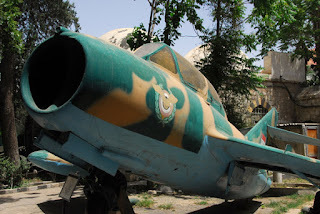 Batch of good photos I collected from web, different than what I posted almost one year ago for aircraft were in display in Military Museum in Damascus. 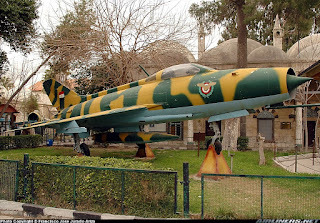 This photo also shows the same MiG-21F-13 with another third camo !! 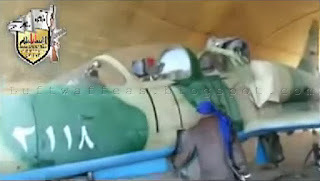 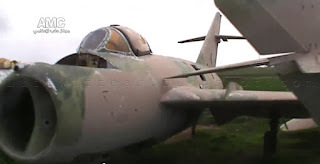 The MiG-15UTI did not survive from the amateur painter !! This is the canopy of the Su-7. 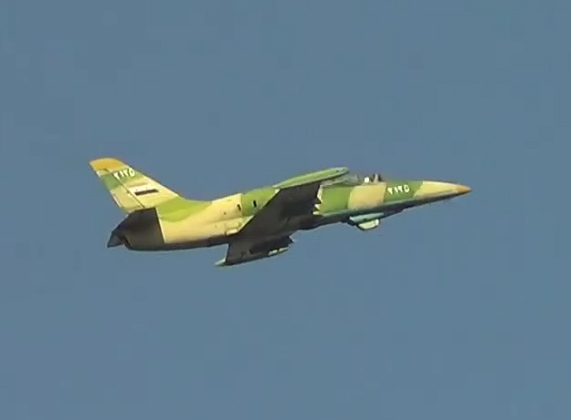 Repainted L-29, with the logo of Aviation Faculty. 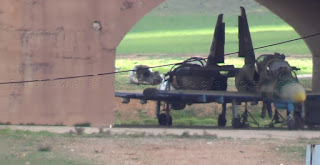 Another shot for the trainer L-29, as I mentioned previously, all these airframes including the propellers were shifted to an unknown destination !! 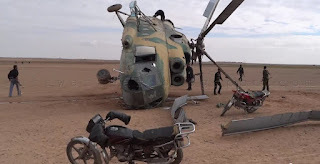 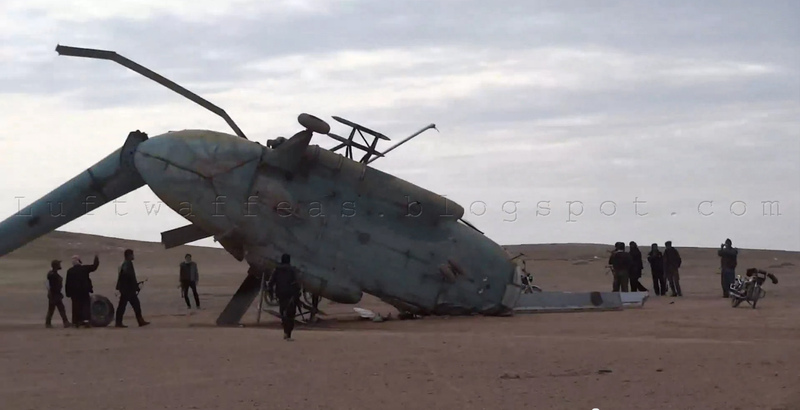 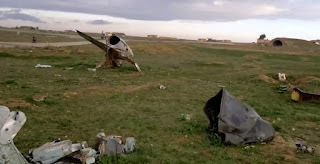 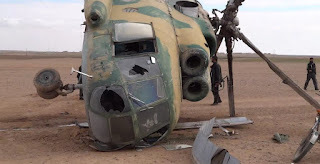 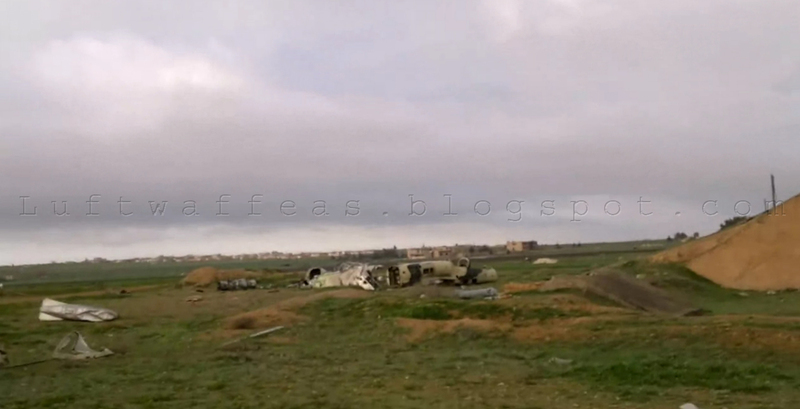 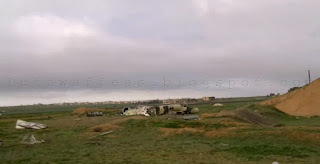 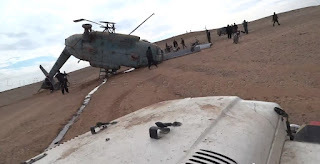 Few HD photos for a SyAAF Mil Mi-8 downed in Mansoura area near Al Tabaqa town in Al Raqqa province on 3 February 2013. Regime used these Mi's to drop explosive barrels over Al Tabaqa town. Another HD shot for the L-39 with serial 2118. 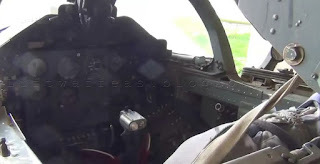 A look at L-39 cockpit. 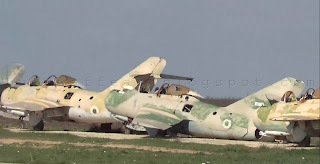 Two MiG-15UTI's in different camo's. 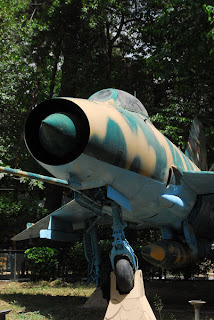 Close shot for another MiG. MiG-17 with old SyAAF flag. 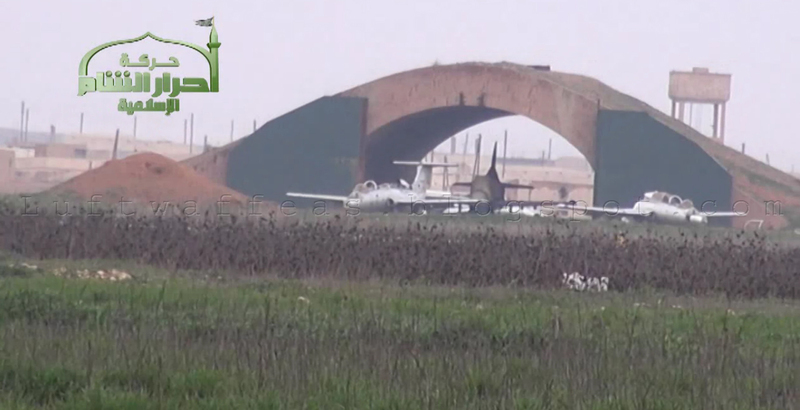 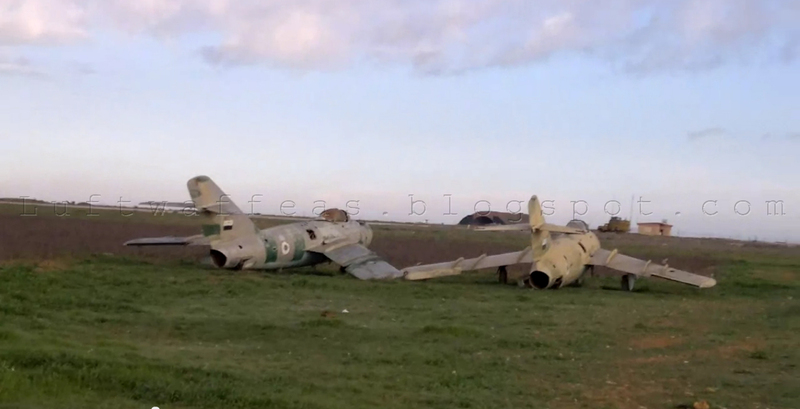 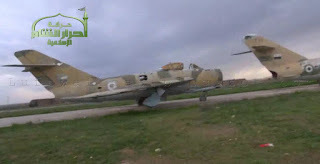 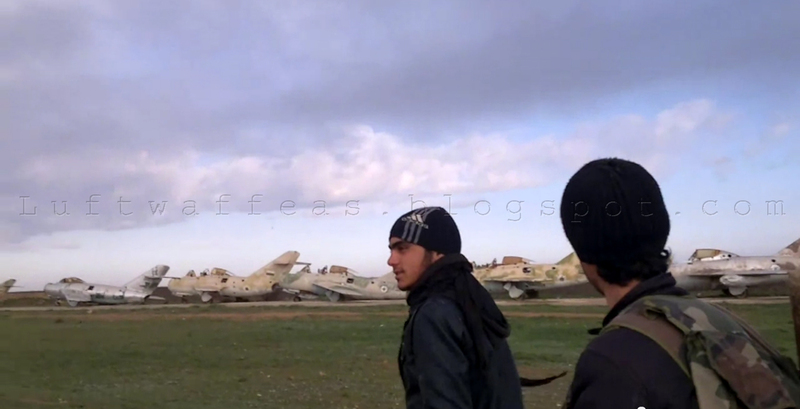 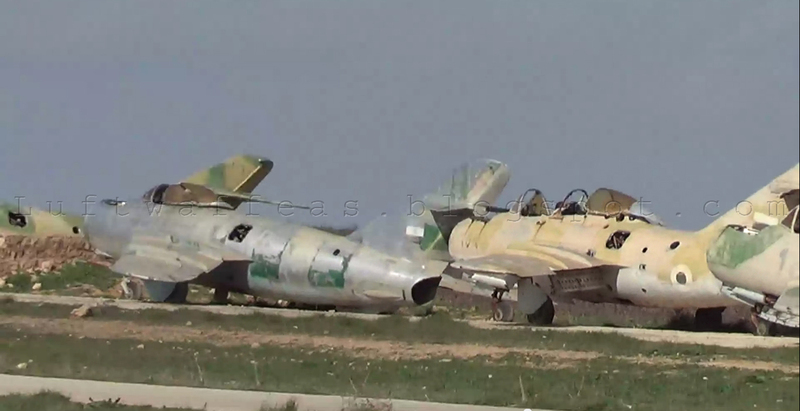 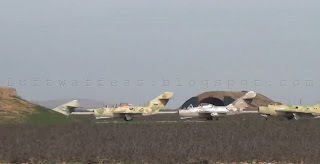 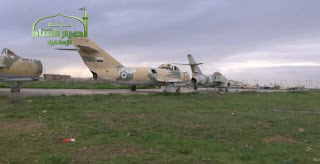 Couple of MiG-17s RIP "hand in hand" , the left one at least carries the old SyAAF flag (Egyptian flag nowadays). 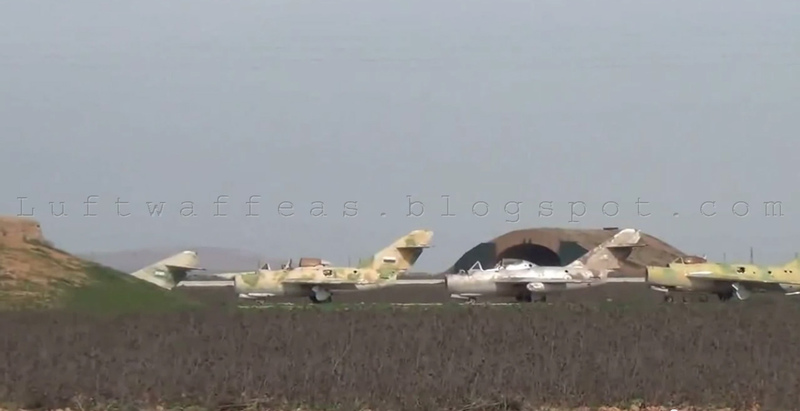 Another still for the row of MiG-15s / 17s, the first two are MiG-17s, the other four are MiG-15UTIs. 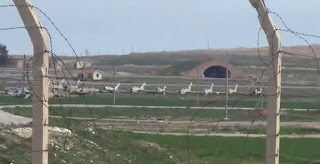 General view for the MiGs boneyard. Double HAS contains four L-39s. 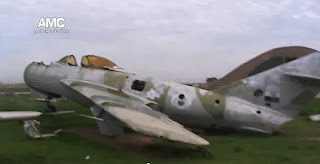 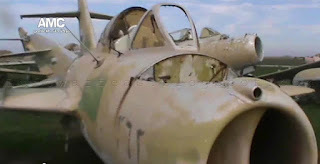 Beside it, remnants of an L-39, rear fuselage and seats. 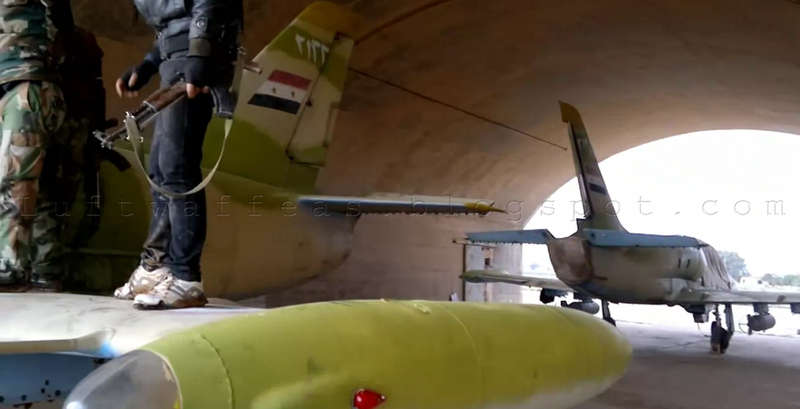 The main fuselage lay to the side of the HAS. Closer view to the back-to-back L-39s. 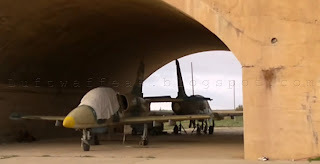 Unfortunately, the serial is covered, but these two airframes look in good status. 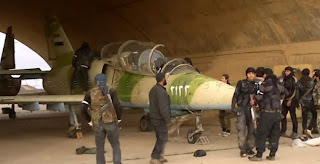 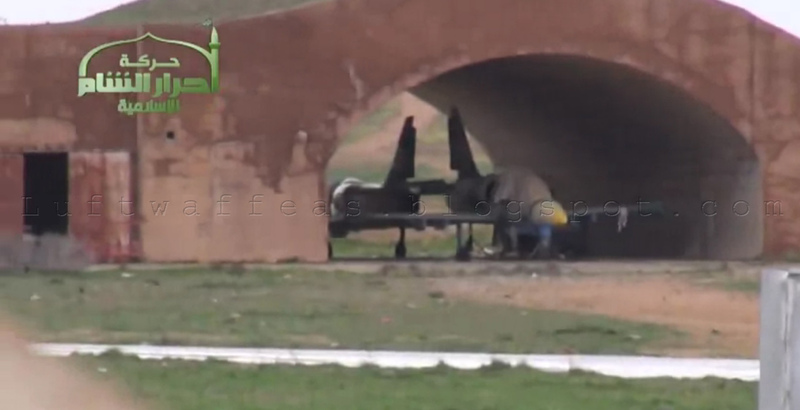 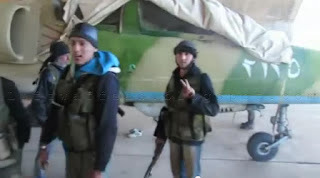 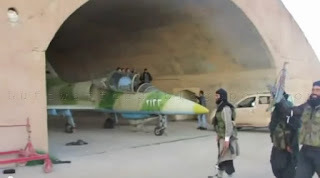 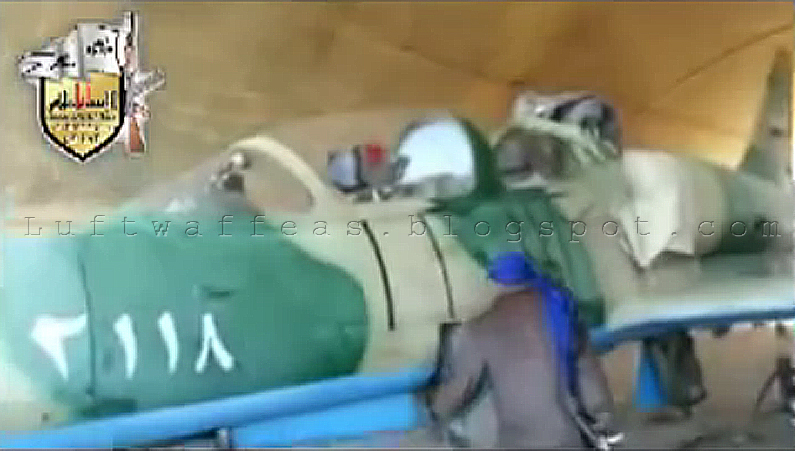 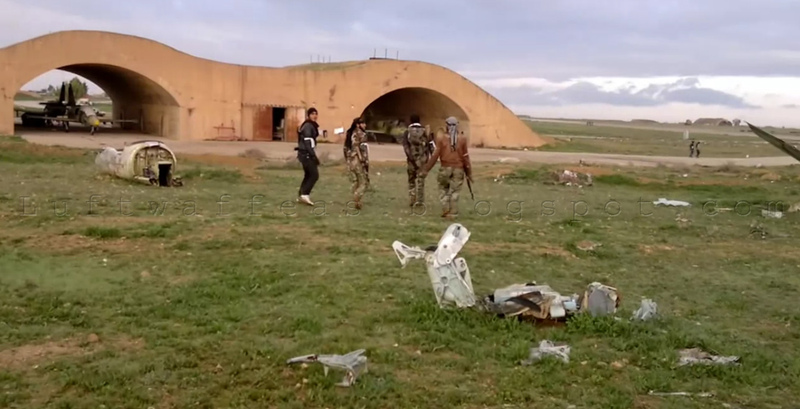 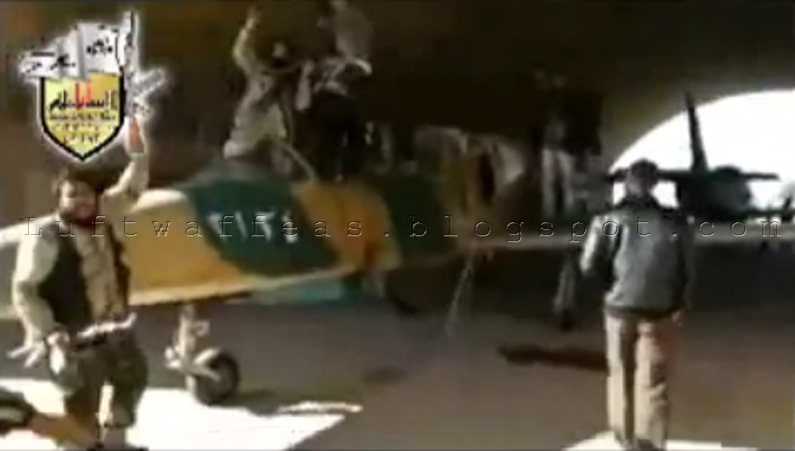 In the other HAS, an L-39 with serial 2133 being examined by rebels. The one to the back is with serial 21xx, fitted with two FAB's. 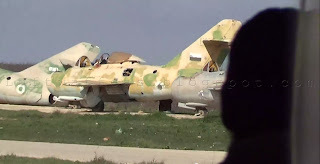 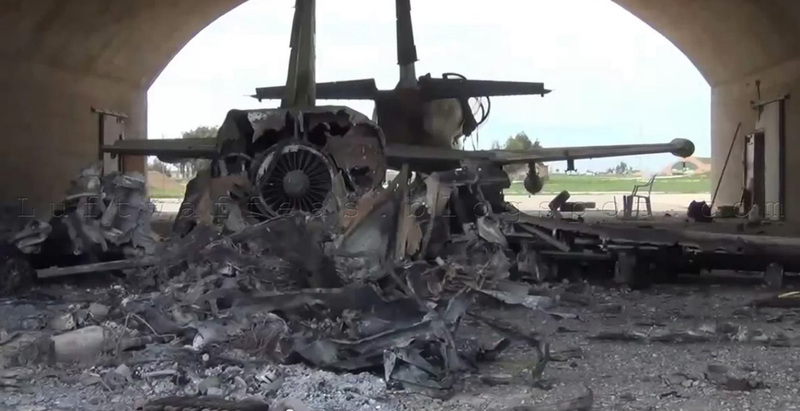 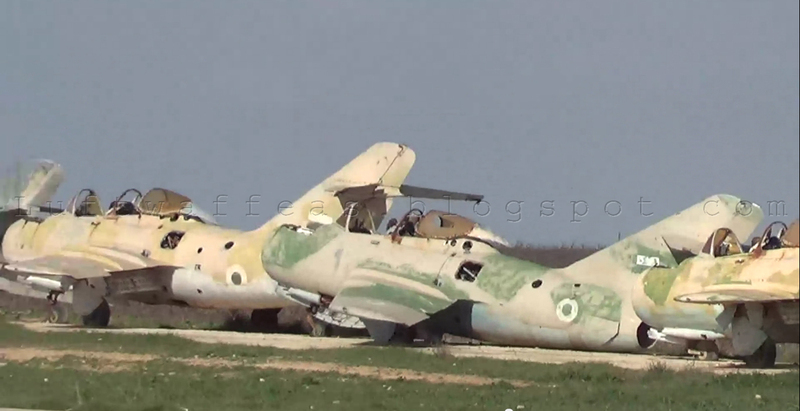 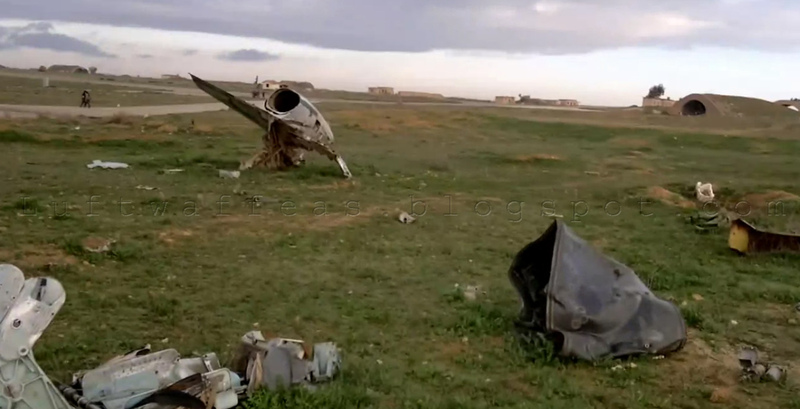 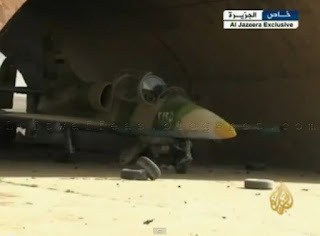 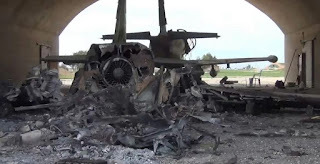 This L-39 with serial 2135 survived the bombing of SyAAF aircraft which succeeded to destroy its mate. 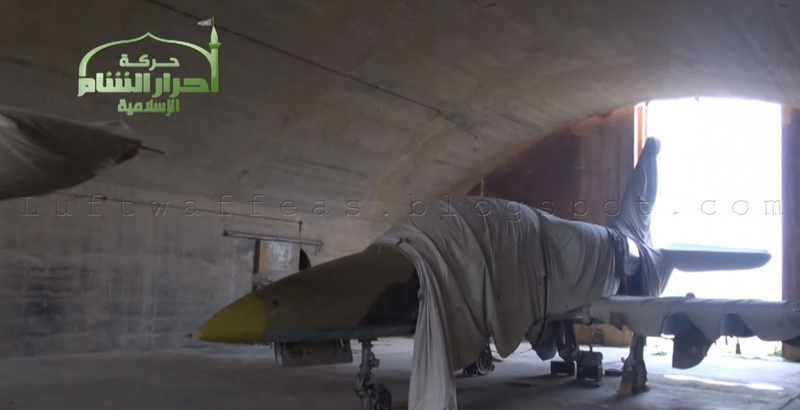 This video was recorded after an aircraft of SyAAF has bombed a double HAS and succeeded to damage an L-39 inside, from footage of another video, the frontal safe L-39 carries the serial 2135. Rebels happily examining an L-39 with serial 2125, note that it is fitted with a FAB on the inner pylon of each wing. L-39 with serial 2134, let's hope no one will mistakenly eject the seat, accidents occurred in the past for inexperienced technical personnel and killed immediately when the seat hit the ceiling of the hanger. 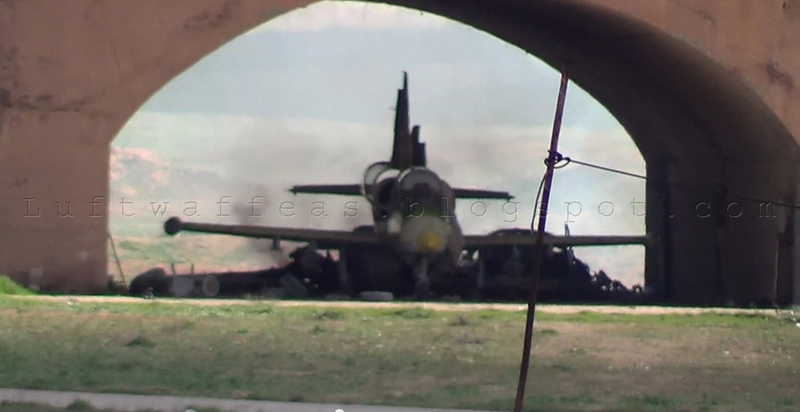 Another safe L-39 behind this 2134. Outdoor, more and more stills for these fabulous MiG-15s and 17s !! 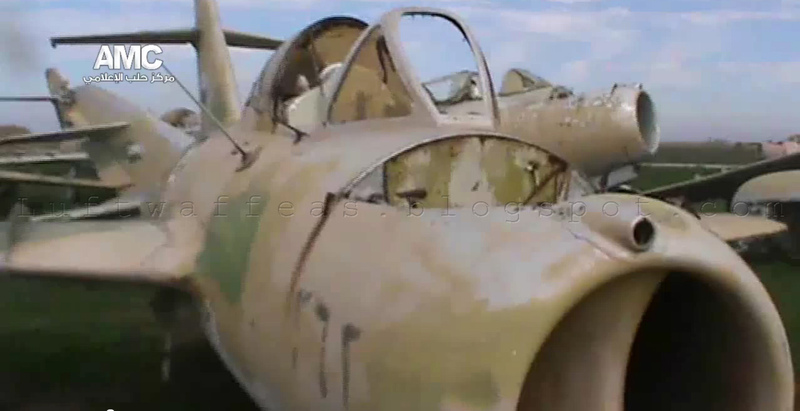 Close up on a MiG-15UTI, it looks it received two layers of camo painting, each one is different than the other. 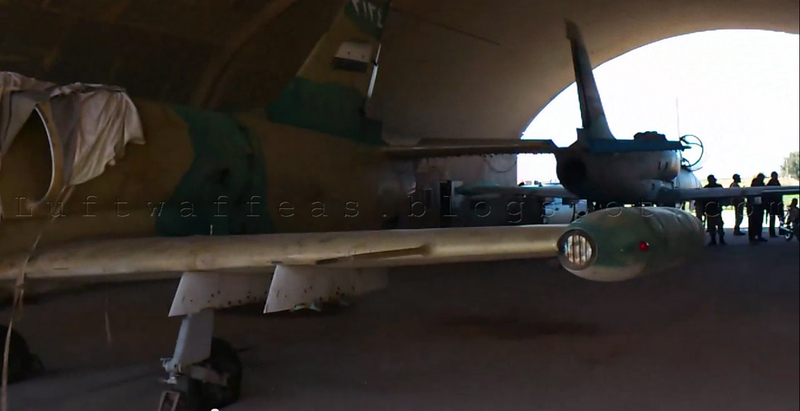 Silver MiG-17 carries the old SyAAF flag (Egyptian flag nowadays). Back to the double HAS where an L-39 was targeted. Another one with serial 2134. 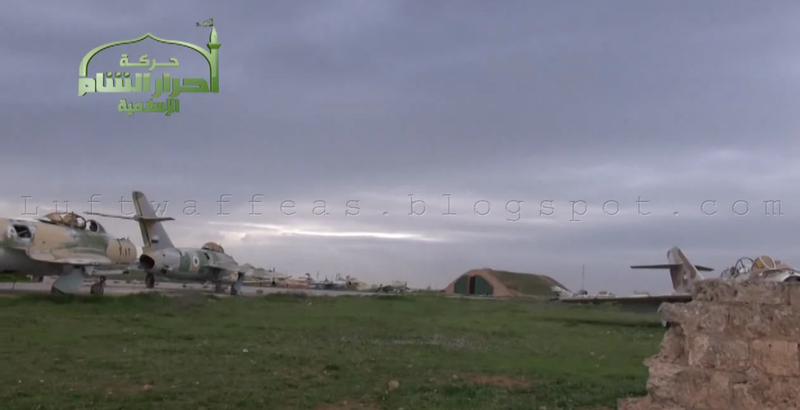 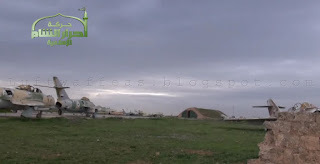 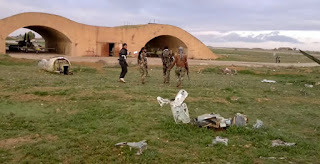 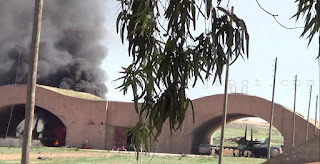 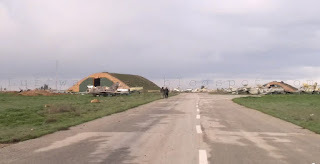 Today, FSyA could seize Kshesh air base which looked abandoned by Syrian Army those already knew it will fall by a day or another in the hands of the FSyA; Anyway, few stills I could extract from "newly born" videos. 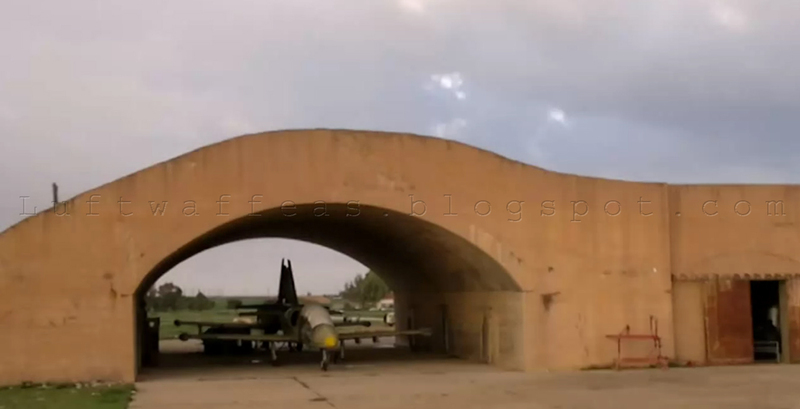 Closer photo for back-to-back L-39's inside a HAS. 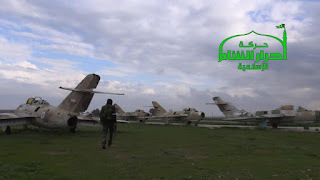 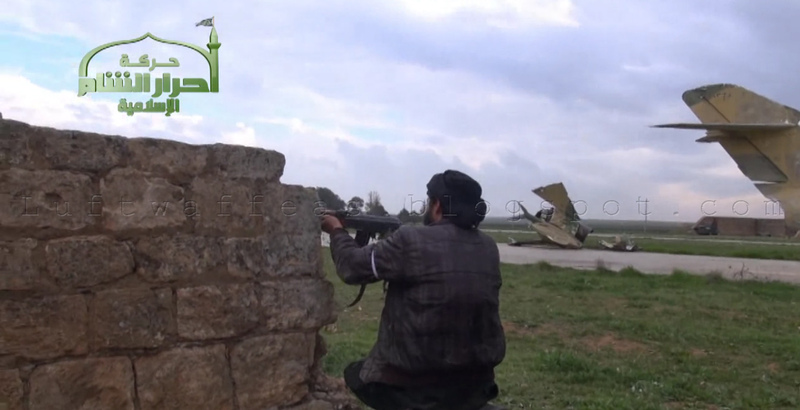 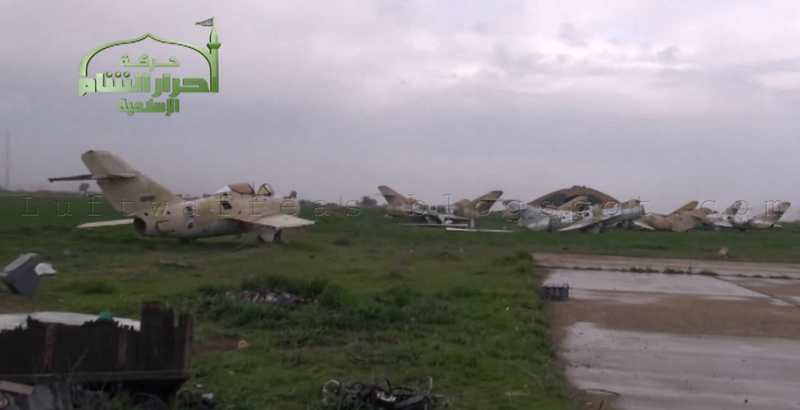 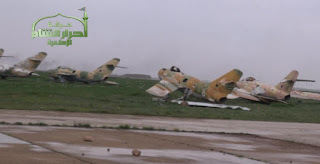 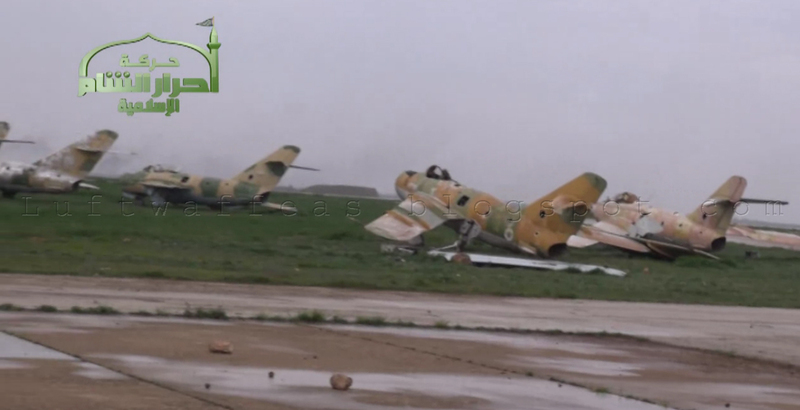 Nice shots by rebels for the graveyard of MiG-15's and 17's. 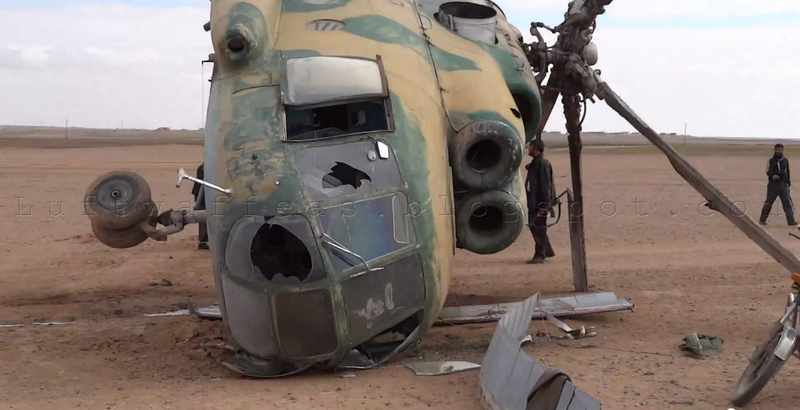 Through years, the camo is washed out, serials as well. 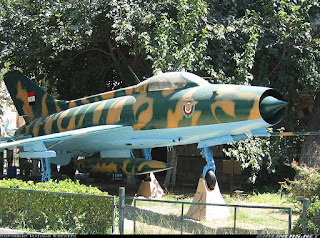 Only few survived their serials like this MiG-17 with serial 2012. At the tip of this MiG-17 fin I can hardly read 1340 ?!? 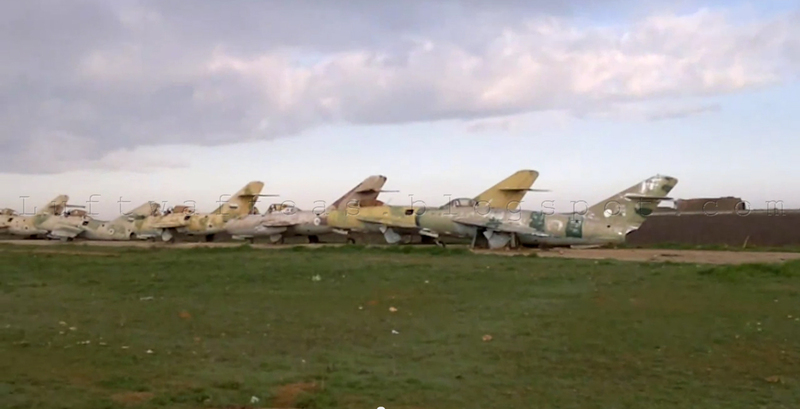 Another shot for the graveyard, note the MiG-15UTI at the far right of the image. 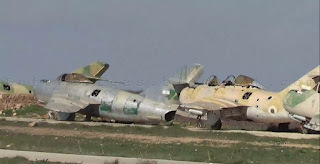 L-39 inside a HAS surrounded by wrecked L-29's. 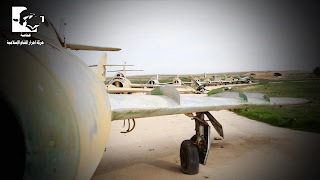 It is very clear that almost each MiG-17 here wears unique camo!! 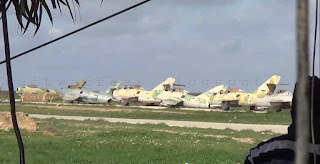 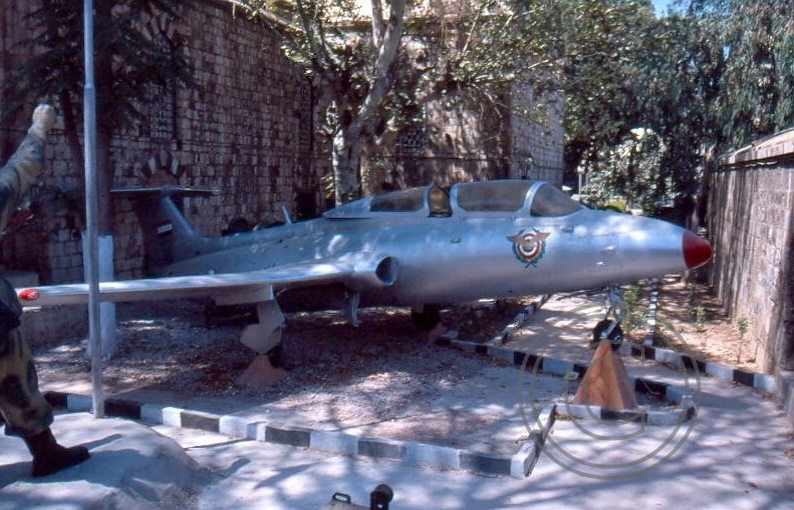 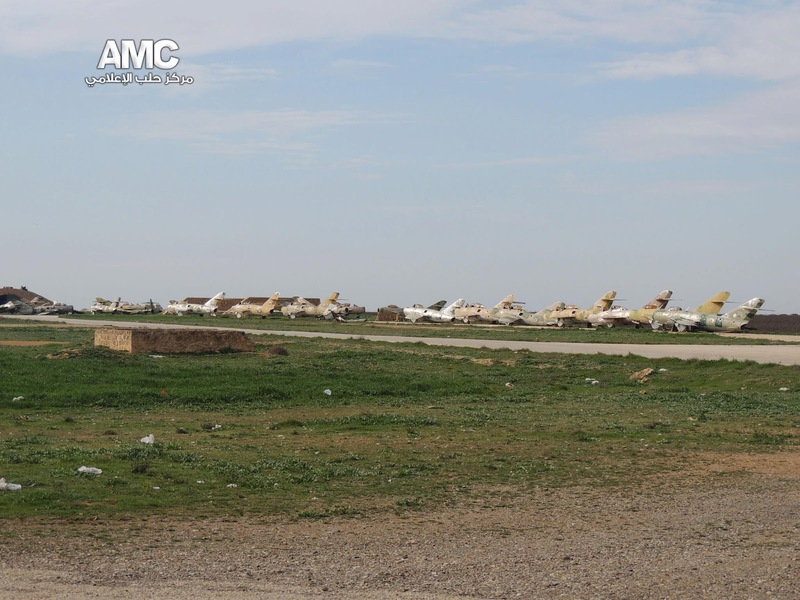 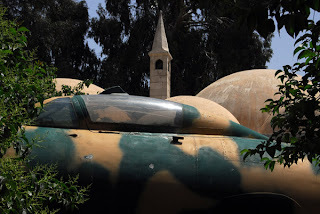 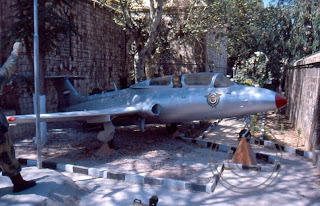 It might be because the MiG-17's were delivered to SyAAF in many batches through years. 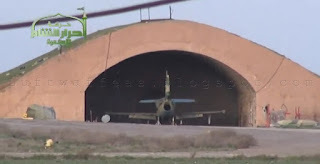 Another MiG-15UTI at the left of the image. 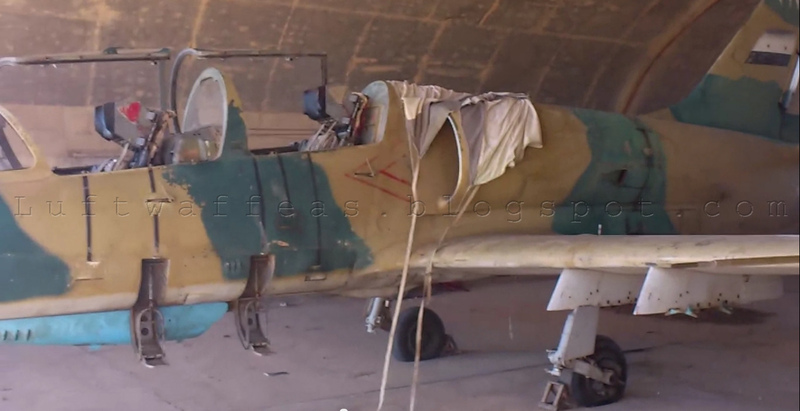 Clear HD still for a stored L-39 with serial 2079 inside a HAS. 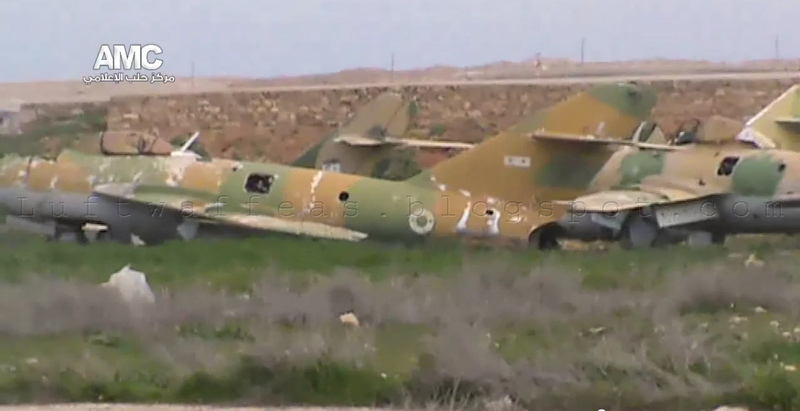 Behind it, another L-39, serial is covered. 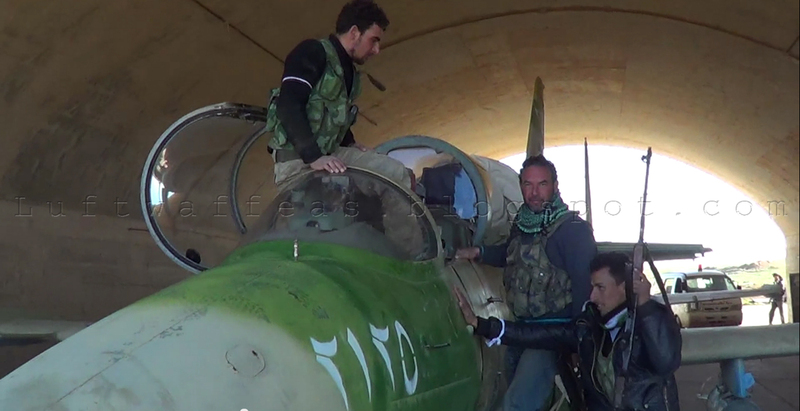 L-39 with serial 2133 being examined by rebels. 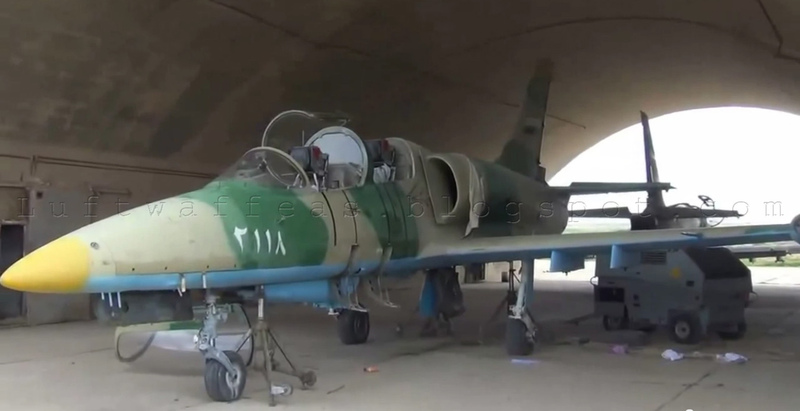 L-39 with serial 2125, in the video it is shown fitted with a free-fall bomb on the wing pylon. 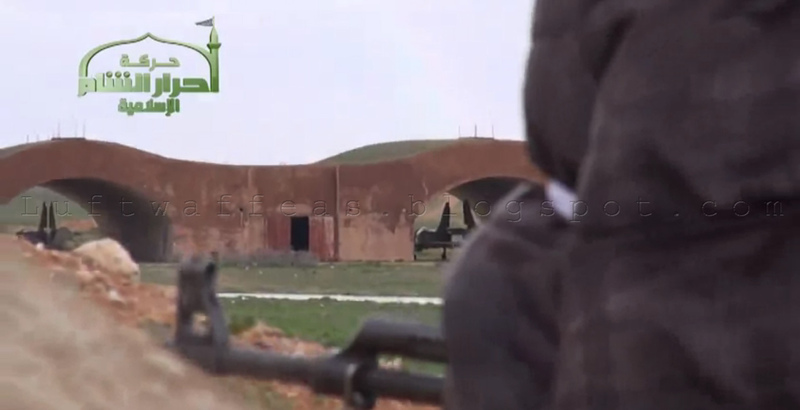 This UNIT was seen in November 2012 in action over ArRaqqa. A rebel in battle field walking behind a MiG-15UTI. 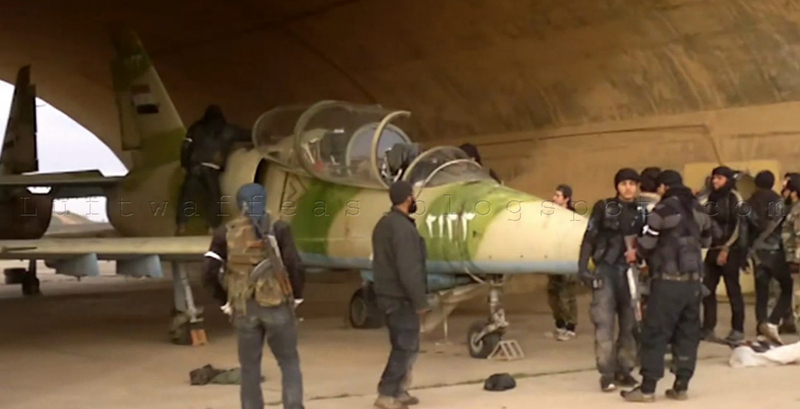 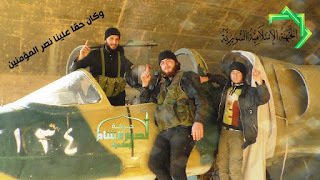 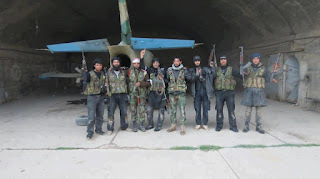 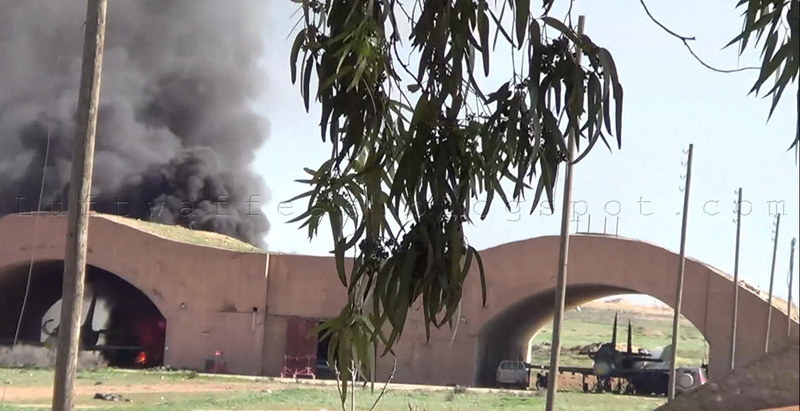 L-39 behind rebels those turned Kshesh Green.